NO MOUSE IN THE HOUSE IS THE LONGEST LASTING, HIGHLY EFFECTIVE, ALL NATURAL MOUSE REPELLENT. Do you have a mouse problem? Out of the many mouse deterrents and traps on the market, which do you use? A short-term repellant that constantly needs to be replaced? A trap, which requires you to clean up after it’s served its purpose? A chemical solution that is a danger to children and pets? How much is it costing you to always replace repellents and traps? The answer is: much more than it should. We’ve found many people struggle to find a humane and cost-effective way to clear out their mouse infestation. Our own frustrations in solving this problem led us to develop No Mouse in the House, an all-natural mouse repellant. It's by far the longest lasting product on the market. No Mouse in the House isn't like other rodent repellants, even when compared to other leading natural pest control brands. 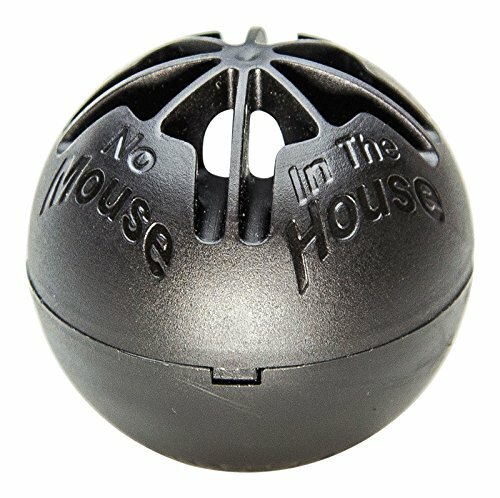 No mouse in the house reservoir & wick design lasts SIX MONTHS! Our Pure peppermint oil stays inside, only vapor diffuses out the top. It’s not just any peppermint oil, it’s a specially honed formula designed for the task. Mice are not harmed, just repelled, and it's safe for pets. Natural ingredients, recycle and/or compost. The oil is contained, there is no clean up. No messy traps, no sticky paper, no worries. Twist off - Remove Seal - Twist on. Then place, toss or roll and DONE! No Mouse in the House is a sturdy plastic ball filled with peppermint oil, an all-natural mouse deterrent. Just set it and forget it. All of the oil stays contained in the ball and releases slowly though our exclusive reservoir and wick design. It's long lasting and highly effective. Peppermint oil is well known as an effective all-natural mouse deterrent. Mice have an incredibly acute sense of smell, which is hundreds of times more sensitive than a humans. A pleasing peppermint smell to you is an highly irritating deterrent to them. Our 100% pure formula attacks their senses and shoos them away. We call this aroma-scare-apy. And don’t worry, our formula won’t aroma-scare your pets! Place units where mice frequent, such as kitchens drawers and cabinets, Take preventative measures and place or toss units into all the entry points where mice could come in your home to keep them out. Each unit lasts six months, three to six times longer than conventional pouches and sprays. Order the best and longest lasting mouse repellent today! Whats the secret behind No Mouse in the House? It’s our continuous-feed reservoir, which disperses our 100% pure high-potency peppermint oil through our wicking system to produce this scent for six months or longer, far outlasting other similar products on the market. No other product has this unique design, and it’s easy to deploy - just remove the seal, set it and forget it. Unlike other essential oil based products, which can evaporate quickly and leave sticky residue behind, No Mouse in the House is long lasting and completely clean.